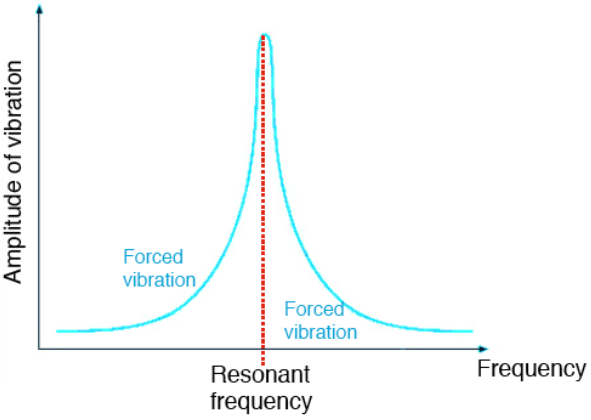 All structures have a natural frequency of oscillation or vibration. A single guitar string will always vibrate at the same speed, giving the same note providing that the length and tension are unchanged. 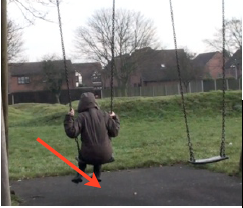 The child below will oscillate back and forth like any pendulum, at a constant rate depending on the length of the pendulum. These are examples of the natural frequency. 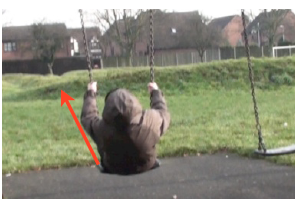 A child can make the swing go themselves by shifting their weight backwards and forwards in time with the period of the swing. They match the movement of their body to the natural frequency of the swing. This is resonance. Resonance happens when the frequency of the “driver” (the source of the energy for vibration or oscillation) matches the frequency of the “driven” - (the structure being made to vibrate). The larger weight at the end is the driver which imparts energy to all the other pendulums. All the weights will oscillate or sway a little, this is "forced vibration or forced oscillation". However the pendulum which exactly matches the length of the driver will oscillate far more than all the others. That is resonance. 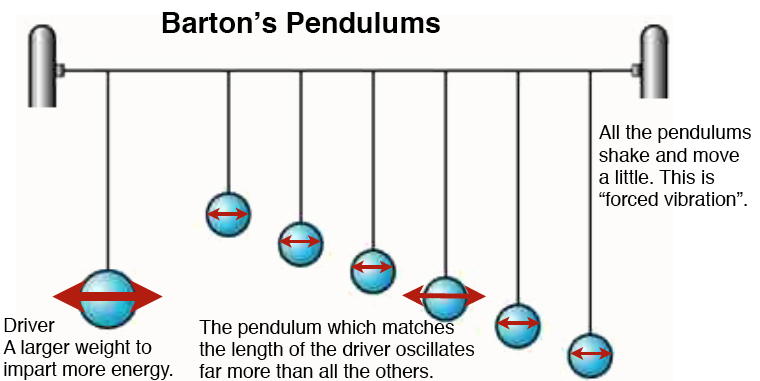 This pendulum and the driver oscillate at the same frequency, but half a swing out of phase, in other words, they swing in opposite directions. 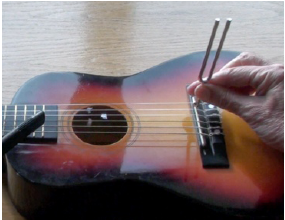 If the frequency of the tuning fork matches the frequency of the string then the string will pick up the vibration. The natural frequency of vibration of the string can be altered by changing either the length or the tension (or both). A match in the frequencies can be shown by placing pieces of folded paper on the string which jump off when the string resonates. If we have a source of vibration in a structure that source is likely to make the whole structure to vibrate at the same rate. That is forced vibration. If the frequency of the source matches the natural frequency of the structure, the vibration will be very much larger. Almost all vehicles have engines within them which vibrate. As the engine speeds up or slows down it is quite likely that there will be one frequency where the vibration of the engine matches the natural frequency of vibration of the vehicle chassis. Resonance here is uncomfortable and can damage the structure. During part of most earthquakes the ground will shake from side to side. This is what causes the worst damage and the worst casualties. If the shaking coincides with the natural frequency of vibration of the building then the damage caused will be catastrophic unless that vibration is damped. Any large structure is likely to sway in a strong wind. History has many example of bridges and buildings swaying uncomfortably because the oscillation caused by wind matches their natural frequency. The most famous example is that of the Tacoma Narrows Bridge Collapse, which you can see below. Design of large structures has to take this into account, either by ensuring that the natural frequency is unlikely to be met or by damping any movement.